Seegene said today it aims to accelerate development of its Seegene Random Access System same-day molecular diagnostics solution through a partnership with Hamilton Company whose value was not disclosed. The random access system is designed to offer same-day order-to-report—and thus enable for same day treatment—by simultaneously performing high multiplex real-time PCR testing on a single platform, regardless of specimen type or assays. Seegene says its order-to-report capability will be enabled by integrating simultaneous and high multiplex real-time PCR testing on Hamilton's automated liquid handling platforms, regardless of specimen and assay type. Based on Seegene's 'One Platform' with universal PCR condition and universal extraction protocol, the single-instrument system is designed to test simultaneously more than 100 high-multiplex real-time PCR assays, regardless of the specimen types or test menus, covering more than 450 targets. The system incorporates a universal nucleic acid extraction protocol applicable to all specimen types such as blood, urine, stool, and sputum. In addition to accelerating development of the random access system, Seegene said the collaboration will also focus on completing its Digitalized Development System, which enables the automation of whole development process from reagent development, clinical studies, manufacturing to quality control. Seegene announced its Random Access System at the 69th AACC Annual Clinical Lab Expo, held July 30-August 3 in San Diego. Seegene focuses on developing multiple-target clinical molecular diagnostics for infectious diseases, genetics, pharmacogenetics, and oncology using proprietary core technologies. Those technologies include DPO™ target-specific primer, designed to provide highly-specific amplification of the target region; TOCE™, designed to enable genetic detection and genetic variation confirmation of five or more targets; and MuDT™ (Multiple Detection Temperatures), capable of simultaneous quantification and detection/discrimination of multiple targets in a single channel without additional melting curve analysis after amplification step. The company says its customers include major hospitals and clinical laboratories worldwide. 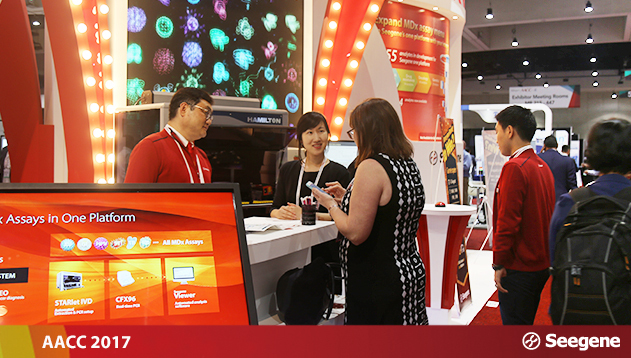 In May, Seegene entered the U.S. diagnostic market by partnering its Allplex™ assay with Thermo Fisher Scientific’s PCR System—a combination the South Korean MDx developer said would create a comprehensive molecular diagnostics solution. Hamilton Company specializes in developing, manufacturing and customizing precision measurement devices, automated liquid handling workstations, and sample management systems.